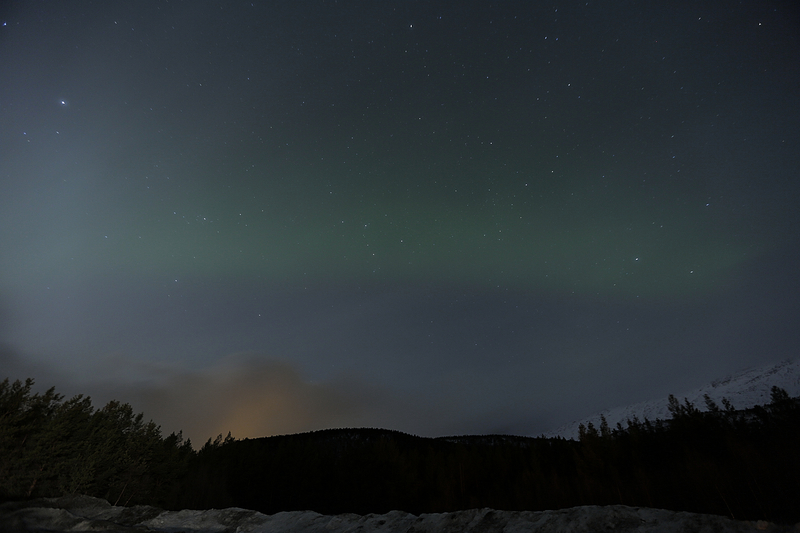 I have always been fascinated by The Northern Lights – The Aurora Borealis. This natural phenomenon – part of the wonder of God’s creation, has enchanted people for as long as they have been on earth. When dreaming about seeing the northern lights, you must remember that you are at the complete mercy of nature. 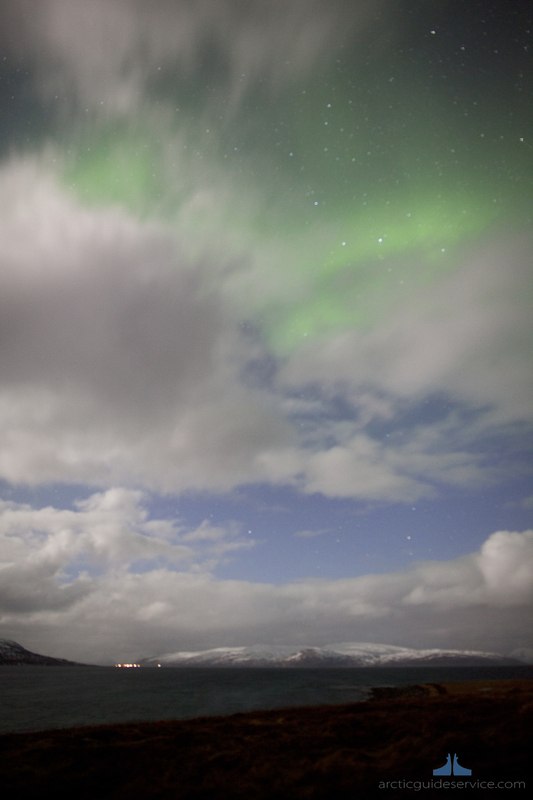 The northern lights love to play hide and seek. Observing the aurora borealis is often a tug of war between your patience and the aurora itself. 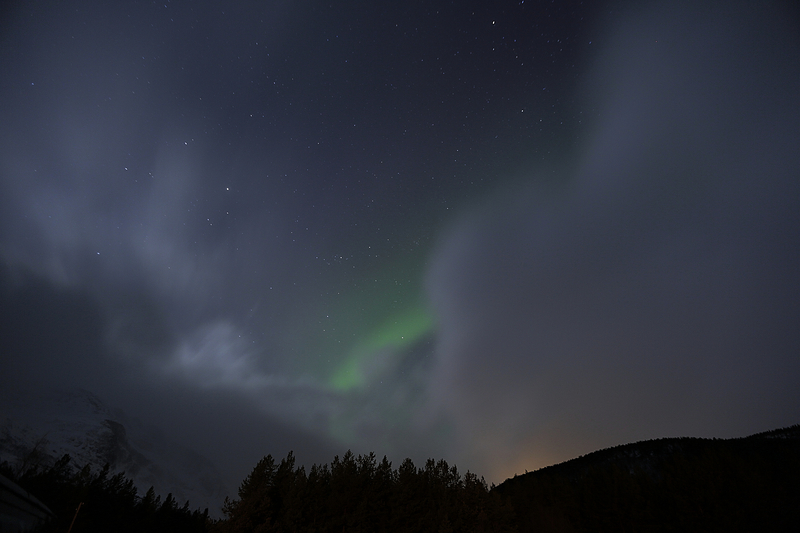 The guidebooks all say that you must ‘stay in the northern lights area at least a week, preferably two, and you will be rewarded – unless local weather suddenly decides to obstruct your view with clouds’. The truth for most of us is that we are restricted to a visit of just a few days. This uncertainty perhaps that just adds to the mystery that surrounds this enigmatic lady. 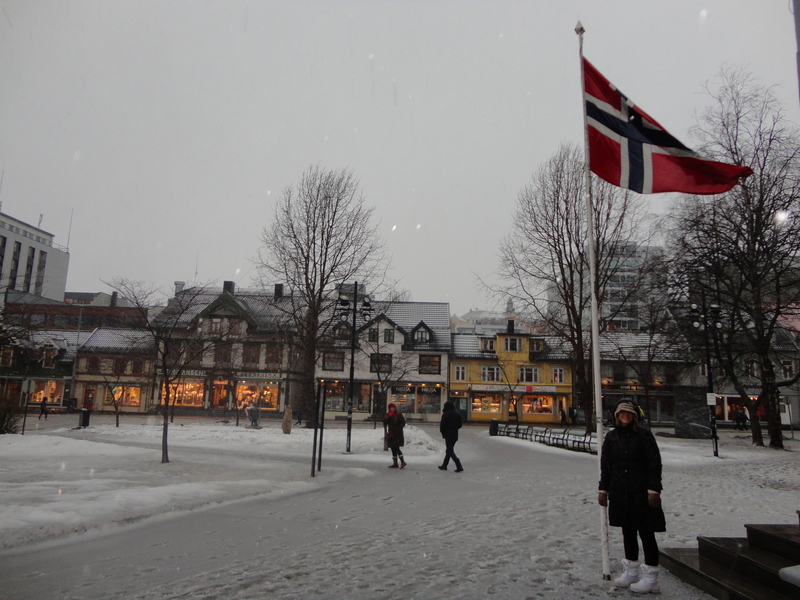 Our interest was further heightened after we watched a brilliant programme by Joanna Lumley about her interest in and visit to Norway to see the Lights. For her and her programme makers time and money was no worry and she had a great view of the lights. After watching the programme, Boo and I made up our minds that we would try to see the Lights for ourselves. The Northern Lights are actually the result of collisions between gaseous particles in the Earth’s atmosphere with charged particles released from the sun’s atmosphere. 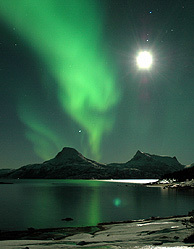 The most common auroral colour, a pale yellowish-green, is produced by oxygen molecules located about 60 miles above the earth. Rare, all-red auroras are produced by high-altitude oxygen, at heights of up to 200 miles. Nitrogen produces blue or purplish-red aurora. 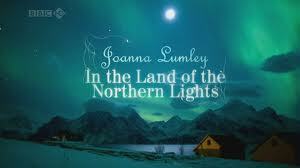 ‘Aurora borealis’, the lights of the northern hemisphere, means ‘dawn of the north’. ‘Aurora australis’ means ‘dawn of the south’. In Roman myths, Aurora was the goddess of the dawn. Many cultural groups have legends about the lights. In medieval times, the occurrences of auroral displays were seen as harbingers of war or famine. The Maori of New Zealand shared a belief with many northern people of Europe and North America that the lights were reflections from torches or campfires. The Menominee Indians of Wisconsin believed that the lights indicated the location of manabai’wok (giants) who were the spirits of great hunters and fishermen. The Inuit of Alaska believed that the lights were the spirits of the animals they hunted: the seals, salmon, deer and beluga whales. Other aboriginal peoples believed that the lights were the spirits of their people. 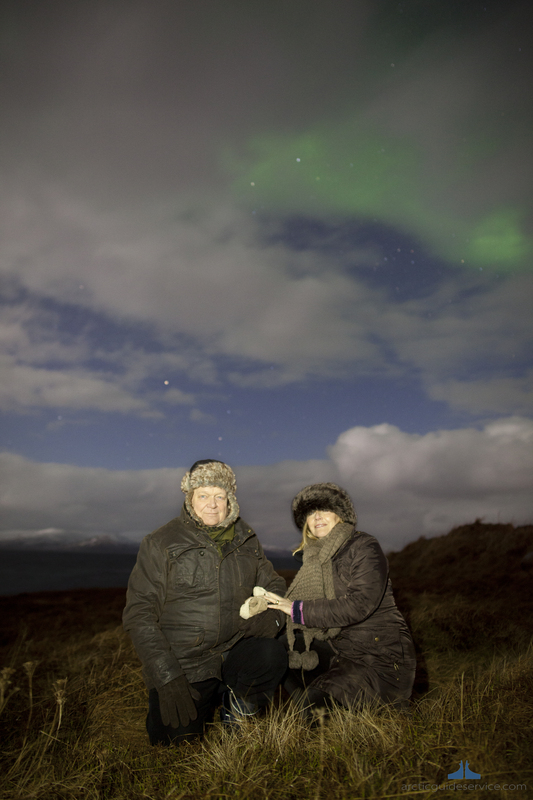 For Christmas 2012, I arranged a trip to Iceland for Boo and me to see the lights. Sadly this trip did not give us a sighting of The Temperamental Lady, as locals affectionately know her. 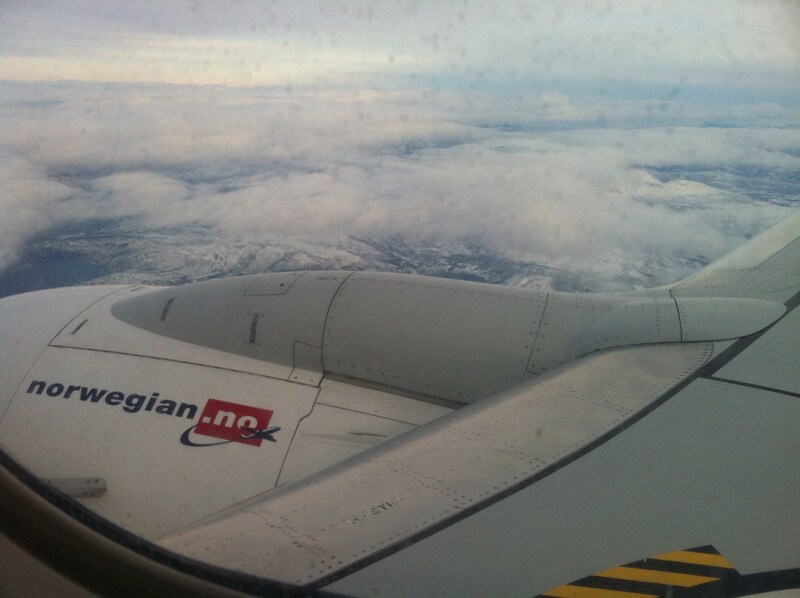 However we loved Iceland and the people. It was a truly wonderful trip. 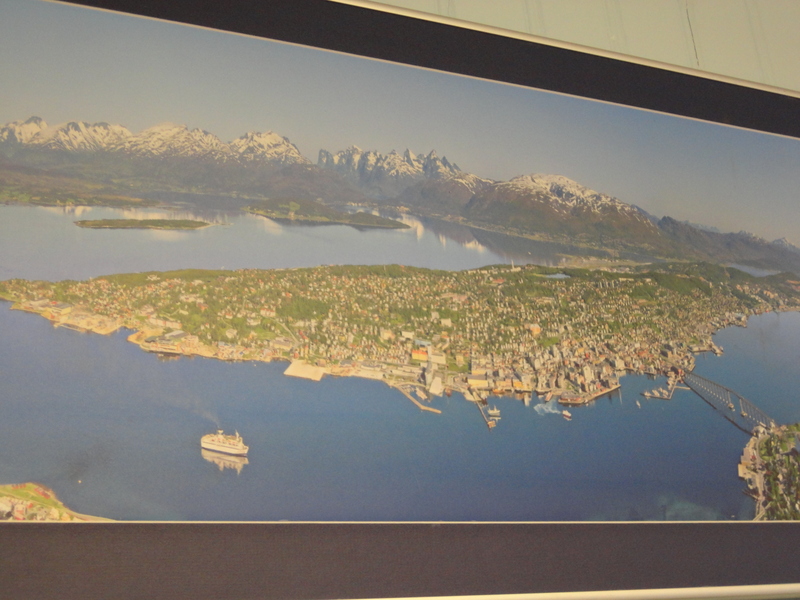 For Christmas 2013 my present to the good lady was a trip to Tromsø. This ticked several boxes. Boo had always wanted to visit Norway, my step great grandfather was Norwegian and the country has always fascinated me, it was the home of Roald Dahl and, of course, it gave us an another opportunity to see the Lights. 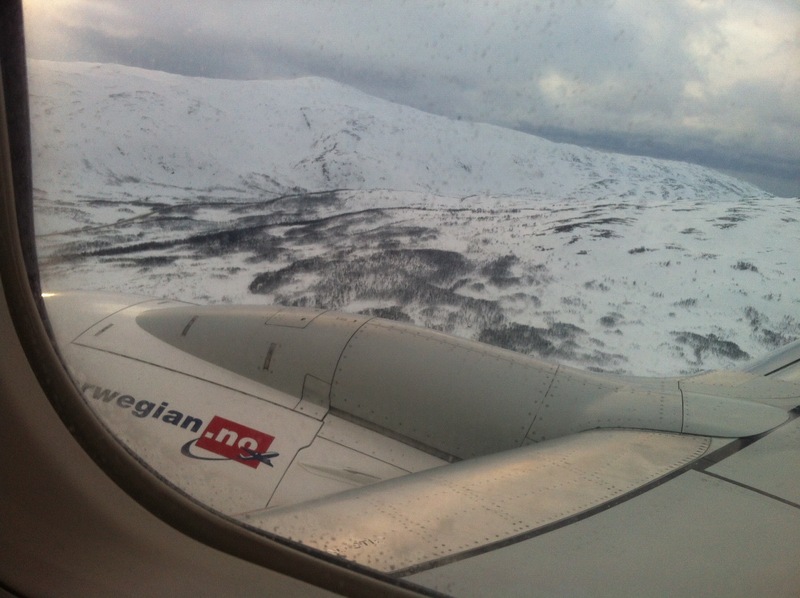 We flew from London, via Oslo to Tromsø. 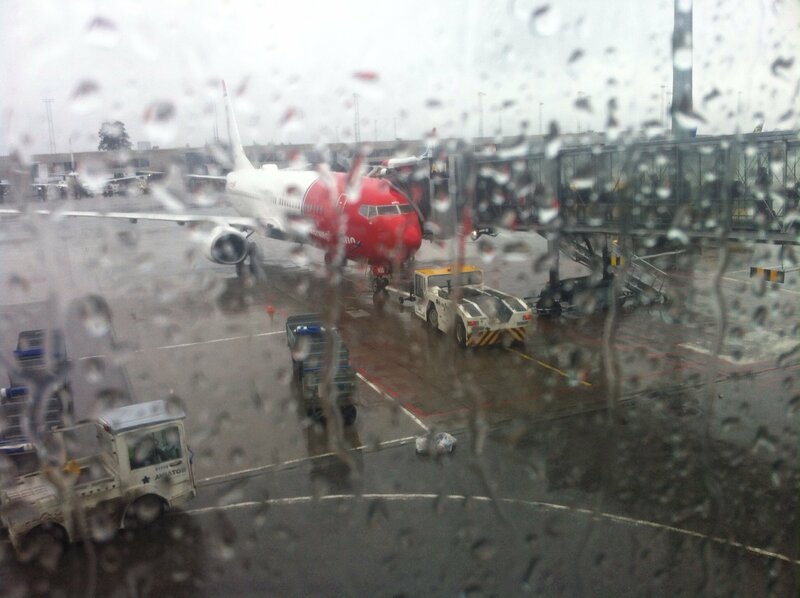 We left in heavy rain. Tromsø city is the ninth-largest urban area in Norway by population and the seventh largest city in Norway population.It is the largest city and the largest urban area in Northern Norway and the second largest city and urban area north of the Arctic Circle. 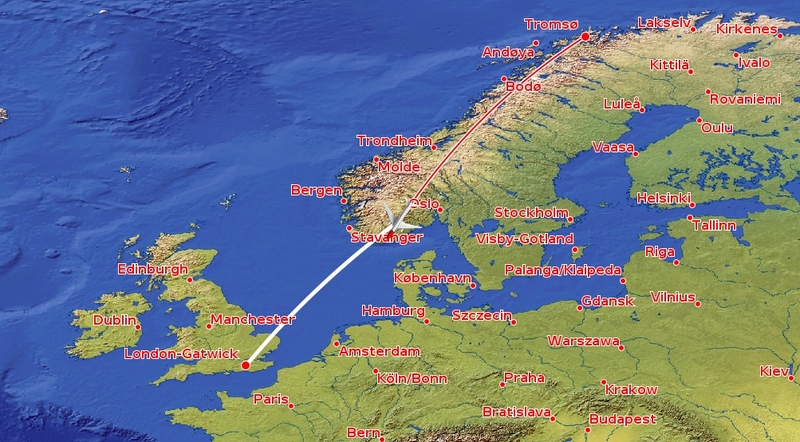 Most of Tromsø, including the city centre, is located on the small island of Tromsøya in the county of Troms, 217 miles north of the Arctic Circle. 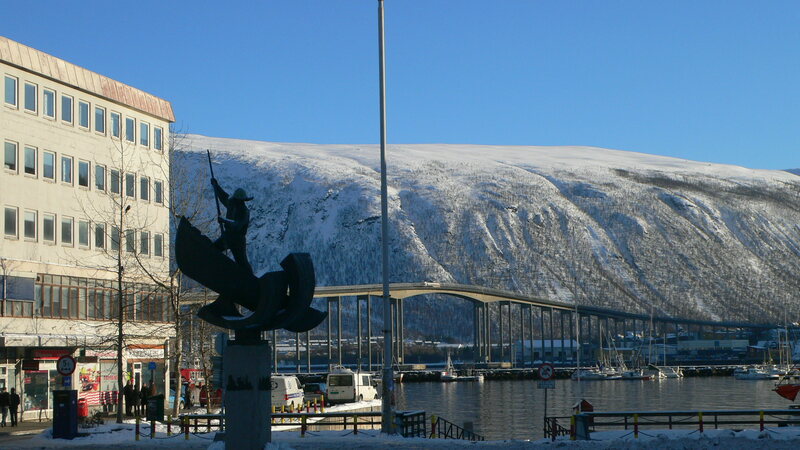 The Tromsø Bridge connects Tromsøya to the mainland and the Trmosoyund Tunnel. The city is warmer than most other places located on the same latitude, due to the warming effect of the Gulf Stream. 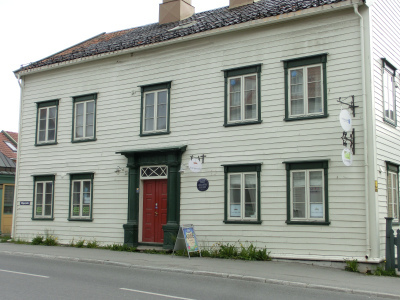 The city centre of Tromsø contains the highest number of old wooden houses in Northern Norway the oldest house dating from 1789. 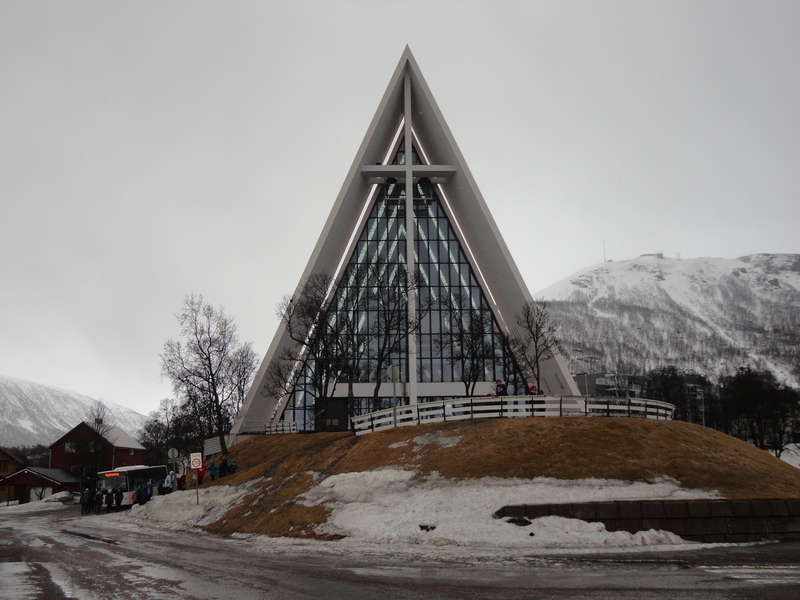 The Arctic Cathedral, a modern church from 1965, is probably the most famous landmark in Tromsø. 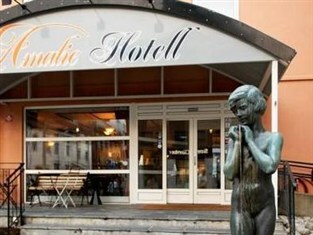 The city is a cultural centre for its region, with several festivals taking place in the summer. 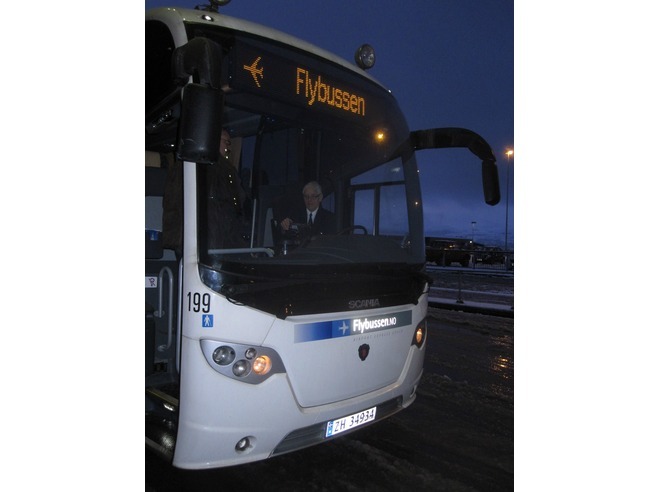 Getting from Tromsø airport was easy using the Flybussen, which took us straight to our hotel. 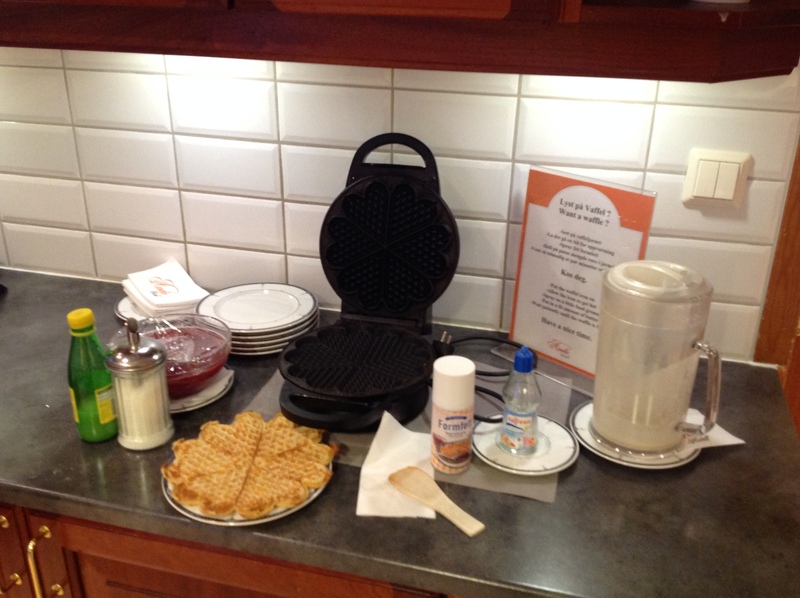 We had chosen this hotel due to its location, offer of free tea, coffee and hot chocolate and above all else the offer of free waffles each afternoon. 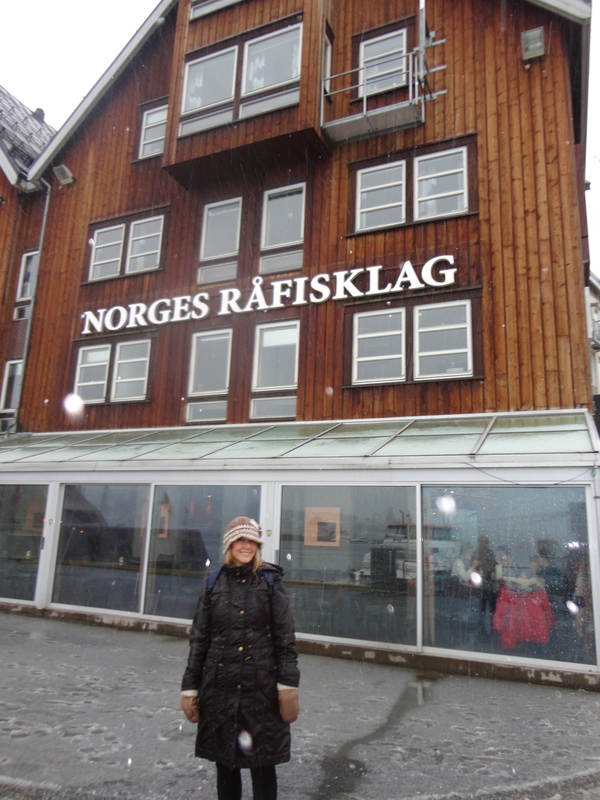 We spent much time exploring this lovely Arctic town. The people we met in the tourist office in shops or walking about were simply delightful and so proud of the place they call home. 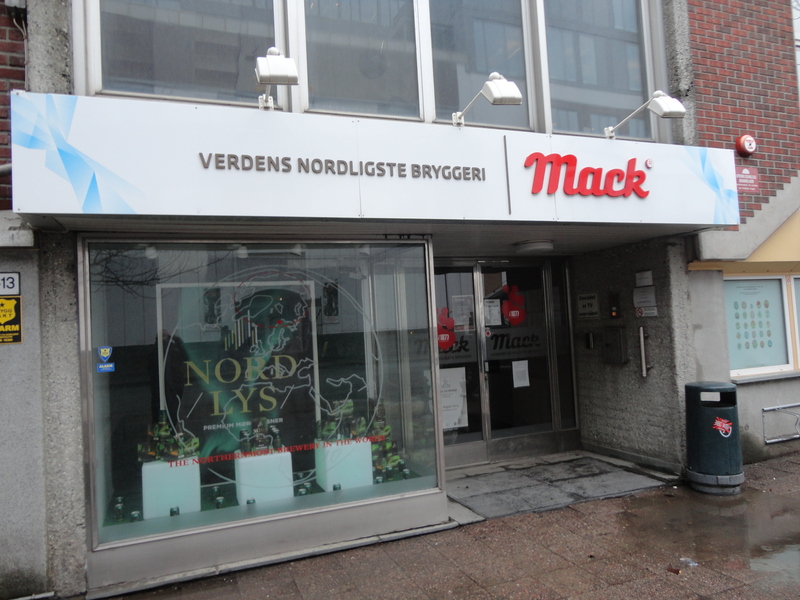 Tromsø is also home to the most northernmost brewery in the world. It’s called Mack. I don’t drink beer but was interested in this unique place. Sadly there were no organised tours during our stay there. We were there though really to see the lights. We had booked with a company called Green Fox Guiding. 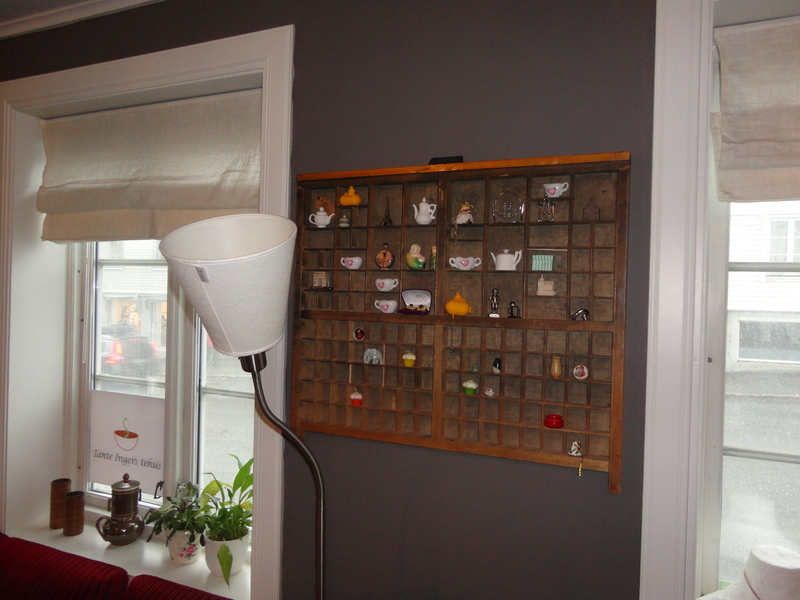 We chose these on the recommendation of a friend and some of the wonderful reviews they had on Trip Advisor. You know what they say… “You get what you pay for” and this chase was worth every penny. Our guide, Markus, was awesome. 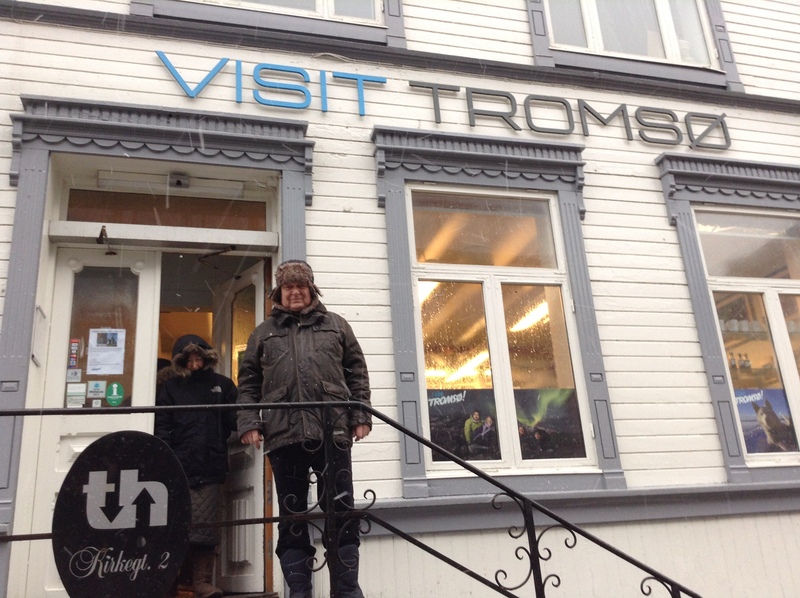 The weather was not good in Tromso at all. 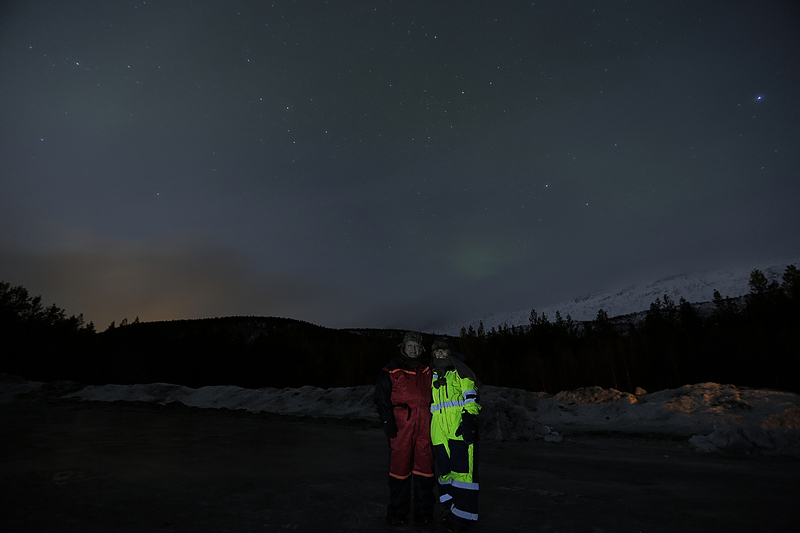 In fact, several northern lights tour companies had cancelled due to bad weather. Not Green Fox, Markus picked up our small group of 8 and took us all the way over to Finland. He just kept going till he could find the best location. He stopped a couple times to check the area for possible activity and would not give up. We had an amazing night with a fire and tea, great biscuits, baguettes, and even roasted some marshmallows on the fire. Oh yes…I forgot to mention the most important part….we saw the lights. We saw so many dancing green and purple lights, it was unbelievable. 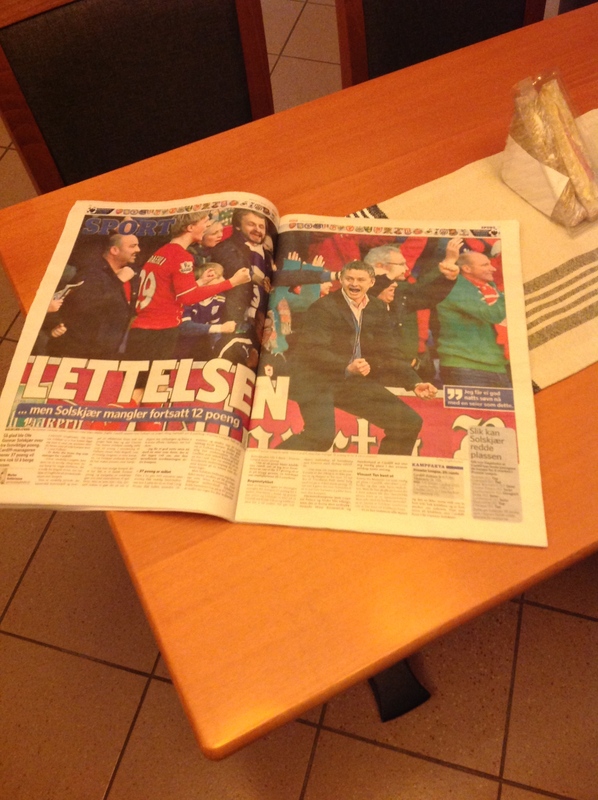 On a night, when we had not hoped to see them at all, we ended up seeing them all over the place in Finland. Thank you for one of the most unforgettable experiences of a lifetime. 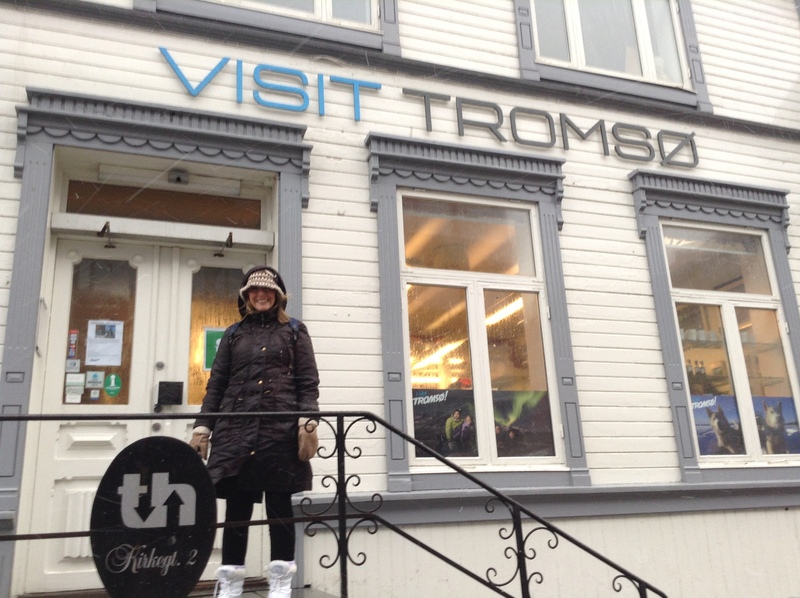 The tour was arranged for our first night in Tromsø. Everything that we had read about Green Fox was true. 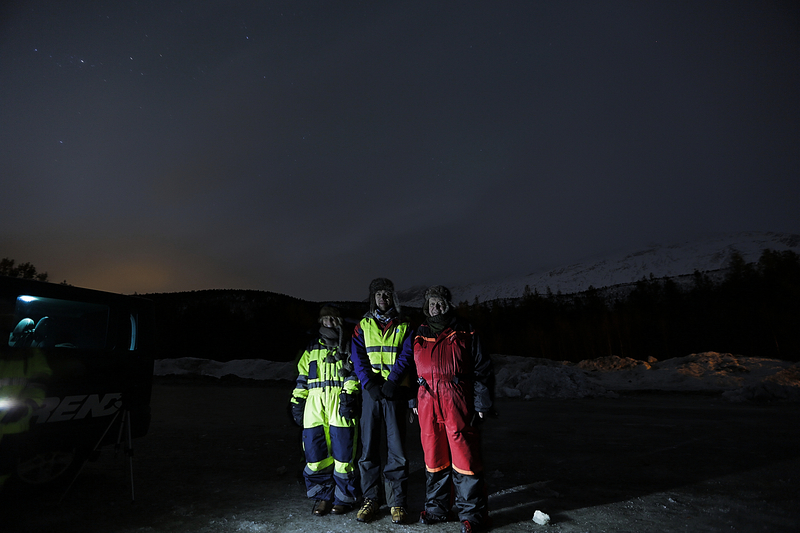 We met Marcus outside the Tourist Office and he took us off to search for the Lights. Marcus’s enthusiasm was infectious. 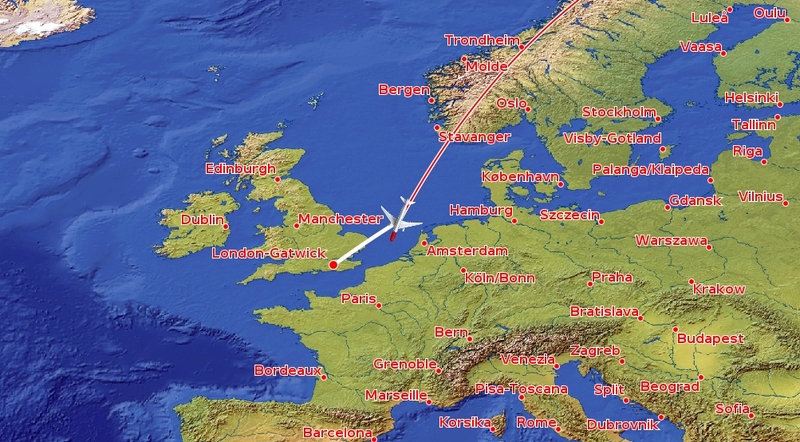 He told us he was taking us to Finland, as he understood they had clear conditions. 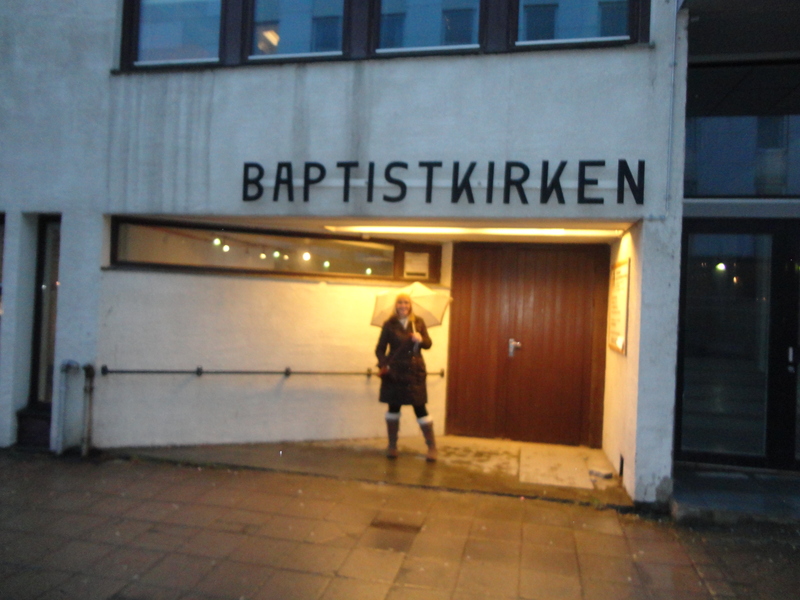 It was pouring down with rain in Tromsø, so we just had to trust him. As time passed the weather worsened, we drove through heavy blizzards and strong winds. After several hours though we came to a stop. A lorry that had skidded in a blizzard blocked the road to Finland. We were marooned on a road that had a large turning place. Marcus looked worried, but as he got out to think about what to do, we saw that they sky was beginning to break into clear patches. After some discussion we decided to stay and hope for the best. Marcus kept us well supplied with coffee and baguettes but we had no real sightings. Neither did we have the promised camp fire. It was frustration all the way. Just as we decided to leave there was thick cloud cover again, we were FREEZING cold and the road to Finland opened again but much too late for us. 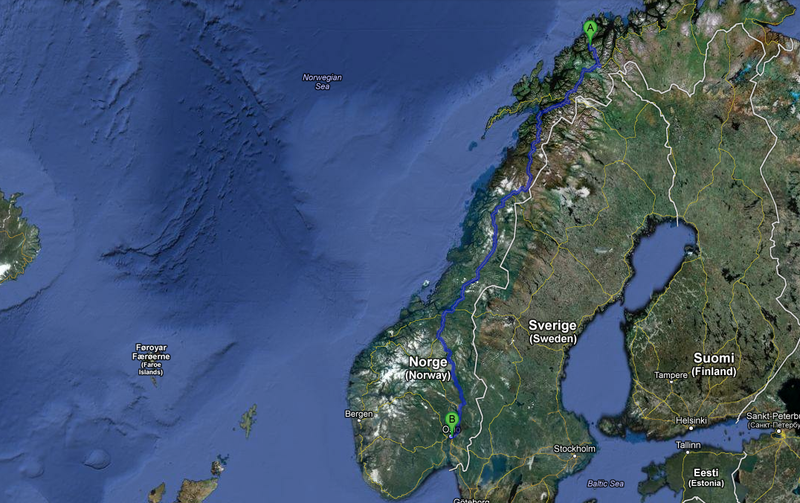 It was a subdued group of passengers in the mini bus that made the long drive back to Tromsø. We got back late, feeling frustrated. The next day I mailed Marcus to thank him and cheekily asked him for another try and he gave me a full refund. Cool! Maybe we could try again. 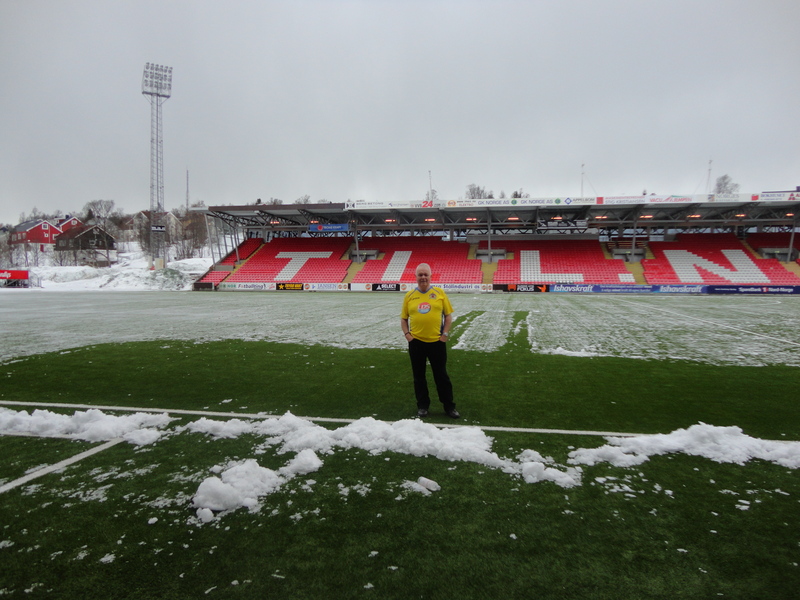 Saturday was spent resting and exploring Tromsø and in particular the football stadium in Tromsø. 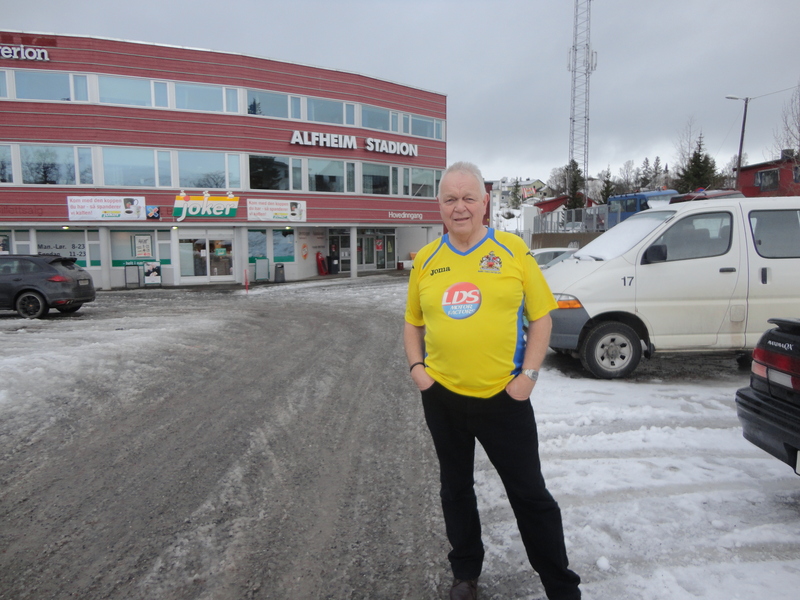 Many top British teams have played here and I was determined to have my photograph taken with my Barry Town top on. 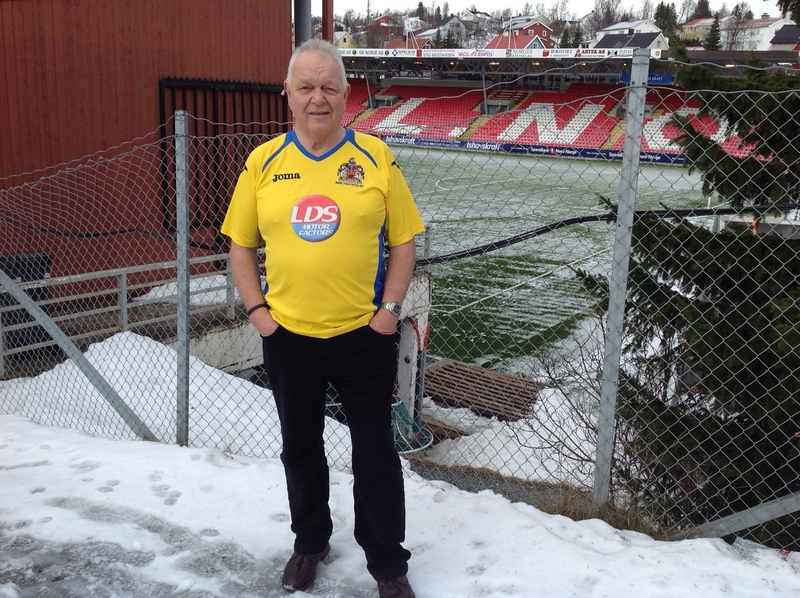 It was a long climb up to the stadium and it was freezing as I posed and Boo did the honours with the camera. 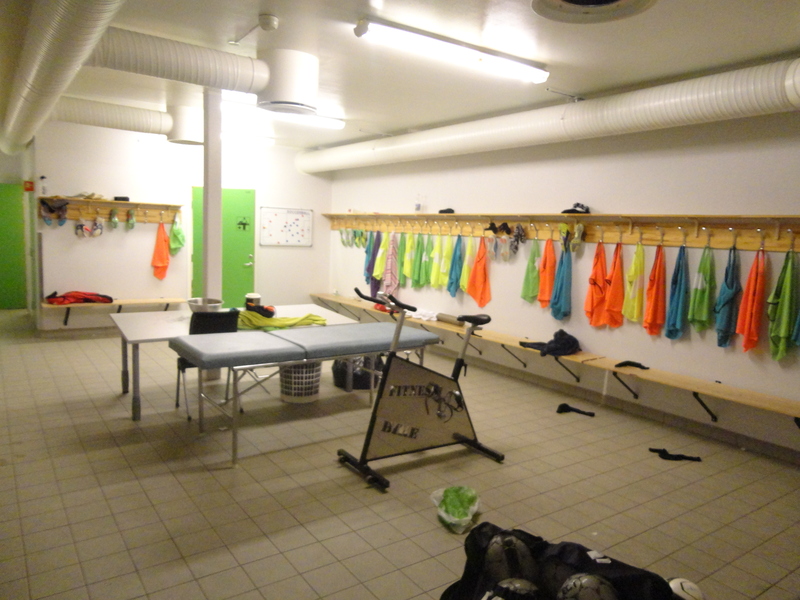 As we strolled around some players came out so I asked if I could look around inside. Amazingly they said yes and let us in. 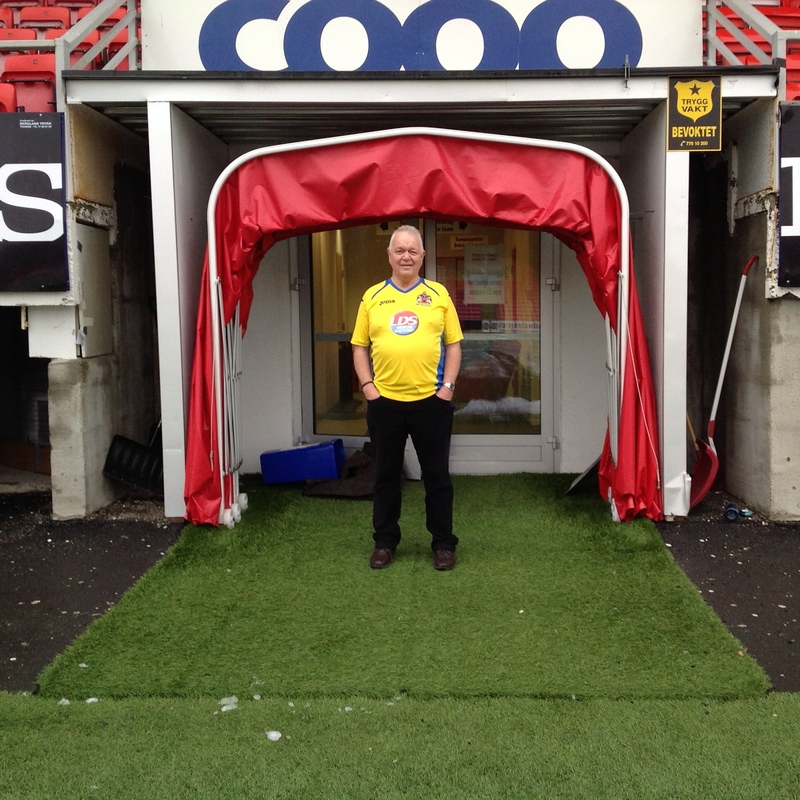 Boo was very unsure but in true Newberry Tours style we toured the home and away dressing rooms and got out on to the pitch, carefully, having ben warned by the players not to let the door close on us otherwise we would have frozen into the hallowed turf. By late afternoon the rain was coming down like stair rods and this continued throughout the evening, which meant another ‘lights chasing’ night was out of the question. We chilled in the hotel, enjoying each other’s company. 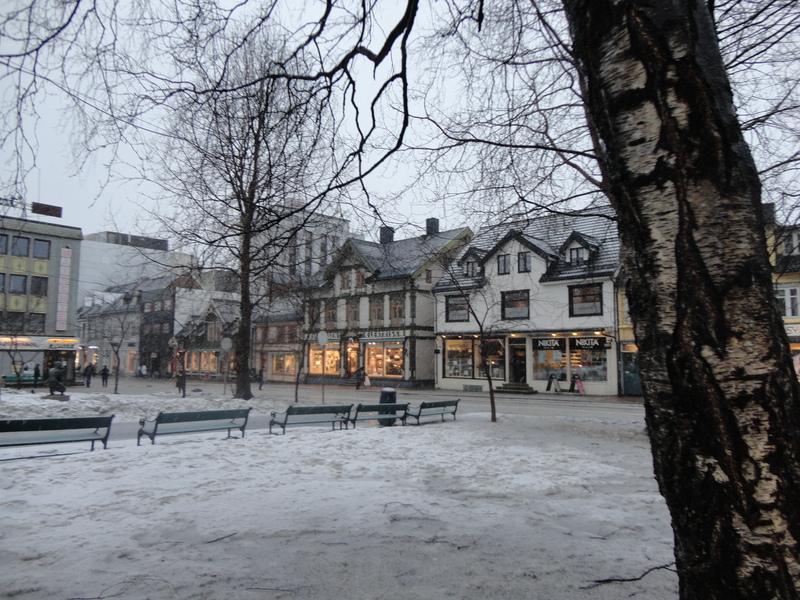 Sunday was a quiet day in Tromsø. No shops were open apart from the odd food shop. We explored the quayside where each day enormous cruise ships would pull in tie up, discharge large groups of passengers and by the next morning be gone. 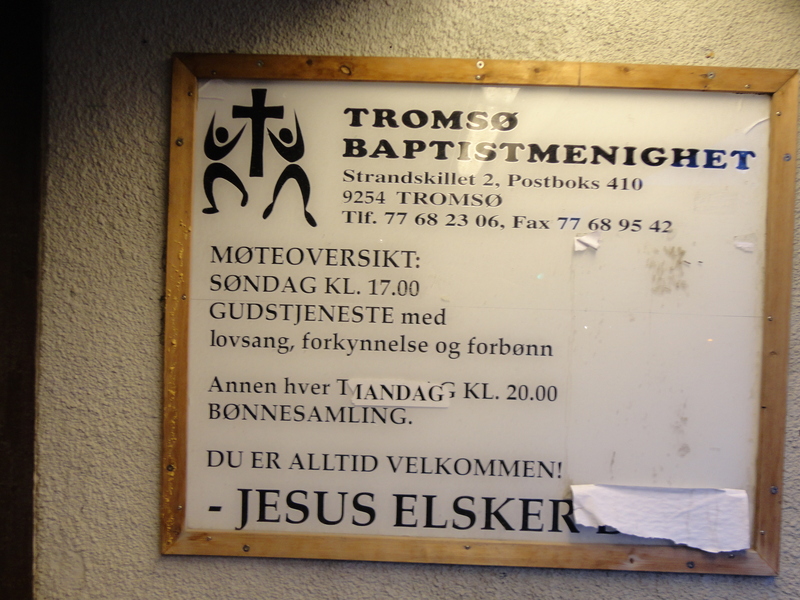 We found Tromsø Baptist Church and arranged our day to attend ‘Evensong’ at 5.00pm. However, we turned up but no one else did! WE were gutted having built our day around it. As we waited a local offered to help and rang several numbers without success. 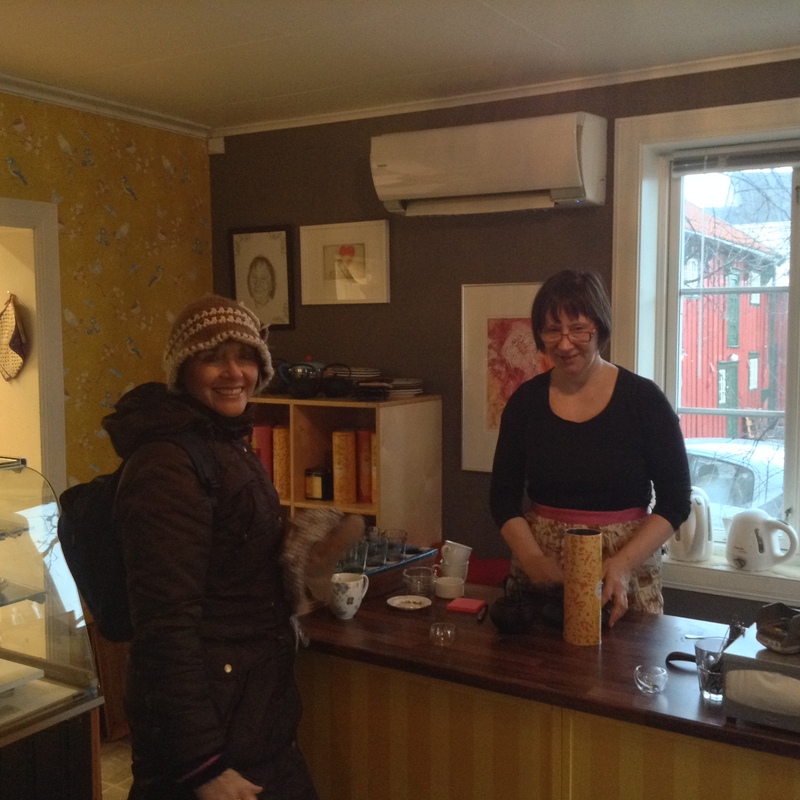 Monday was to be our last full day in this lovely little Norwegian town with its delightful people. 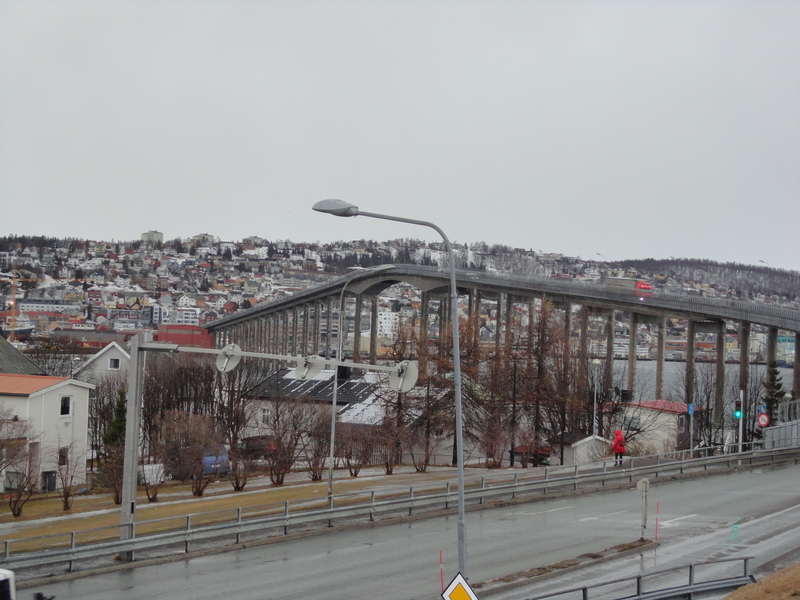 We had decided to walk across the Tromsø Bridge, which connects the island to the mainland. 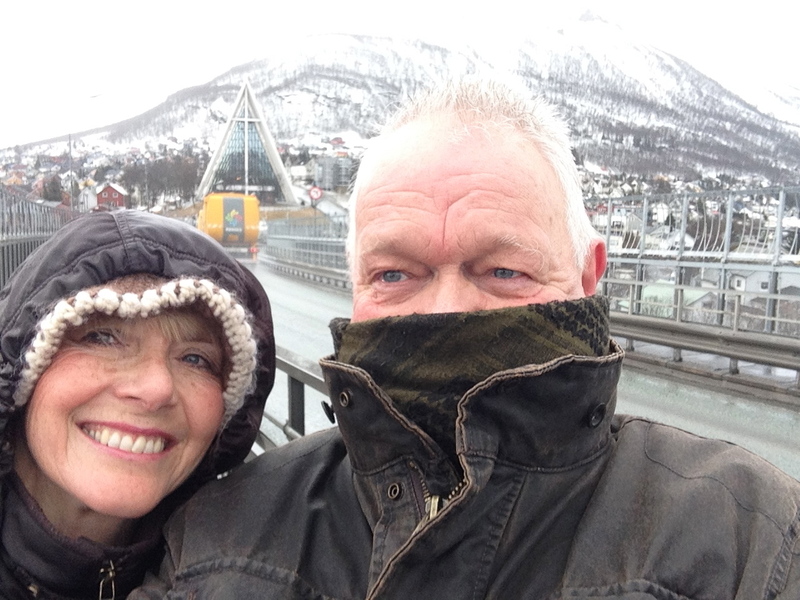 We dressed up warmly and set off on the walk of the couple of miles across and back. 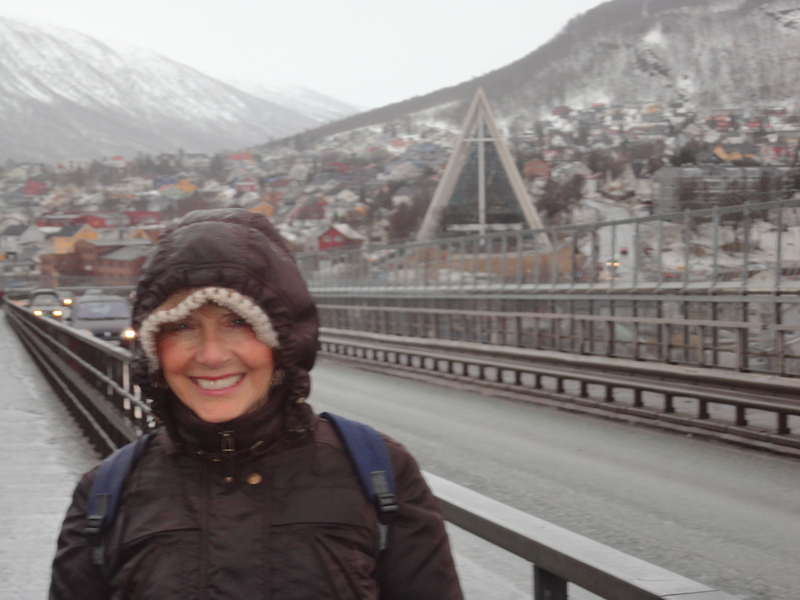 The walk was tiring, especially the outward side, up the slope of the bridge with the biting wind chilling our faces. 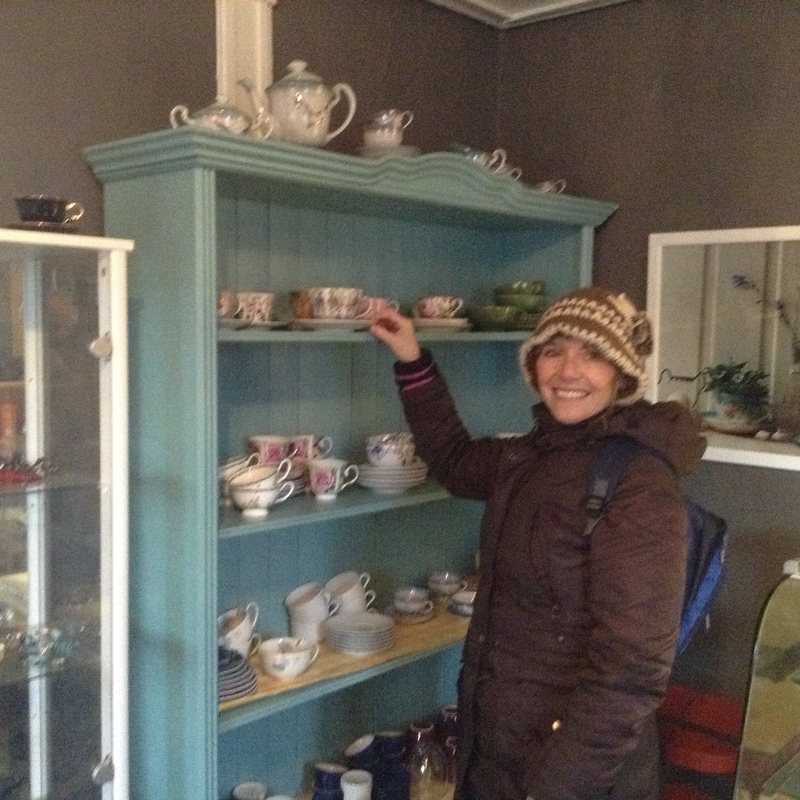 I had left my hat back in the hotel – schoolboy error! Going down the other side was a bit easier and the sight of The Arctic cathedral – our destination – kept us going. 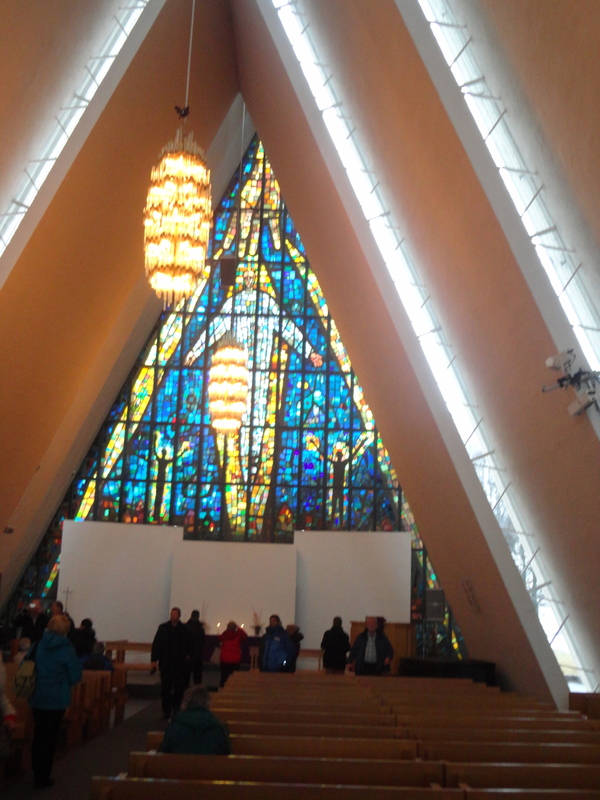 The Arctic Cathedral, formally known as Tromsdalen Church or Tromsøysund Church is a church in the city of Tromsø. The church is commonly nicknamed the Ishavskatedralen, literally “The Cathedral of the Arctic Sea or “Arctic Cathedral”. The church was built in 1965 and it is a parish church and not, in fact, a cathedral as it is commonly called. 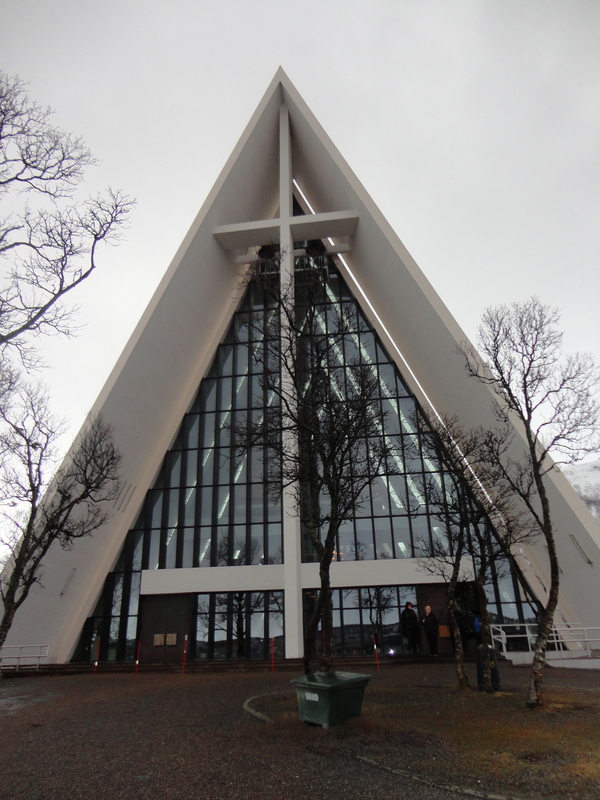 The church was designed by Jan Inge Hovic and is built mainly of concrete. 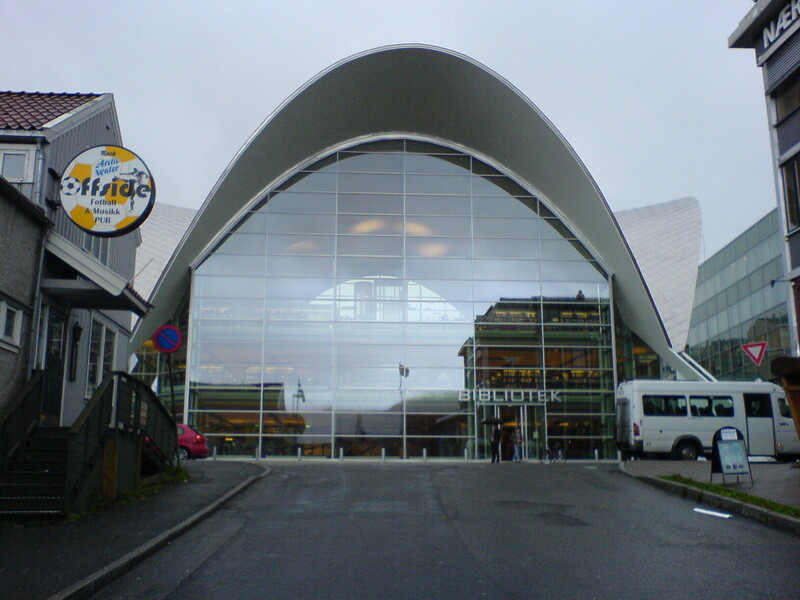 Because of the church’s distinct look and situation, it has often been called The Opera House of Norway”, likening it to the Sydney Opera House in Australia. 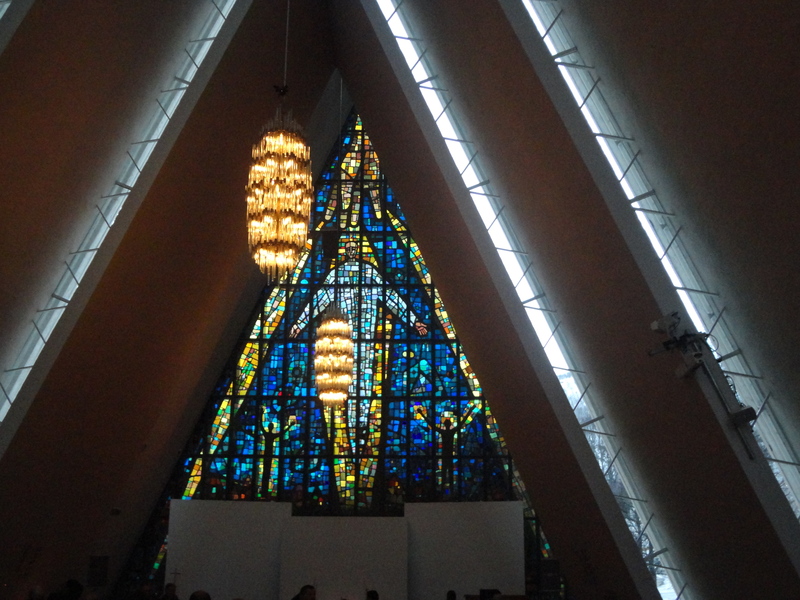 The church is probably the most famous landmark in Tromsø, although Tromsø does have another church of interest, Tromsø Cathedral which is noted for being the only wooden cathedral in Norway. The ground breaking of the church was 1 April 1964 and it was completed in 1965.The new church was consecrated on 19 November 1965. The church is built out of cast-in-place aluminium-coated concrete panels. In 1972, a glass mosaic was added to the eastern side. The church acquired an organ built by Grönlunds Orgelbyggeri in 2005, with three manuals, pedal, 42 stops, and 2940 pipes.It replaced the old opus nr. 12 organ delivered by Vestlandske Orgelverksted, Hareid, which had 22 voices and 124 keys. On the journey back across the bridge w noticed that some people had put locks on, swearing undying love – a bit like the bridge near Notre Dame in Paris. The journey back was easier with the strong wind at our backs. We had determined to make a very important stop when we returned across the bridge. 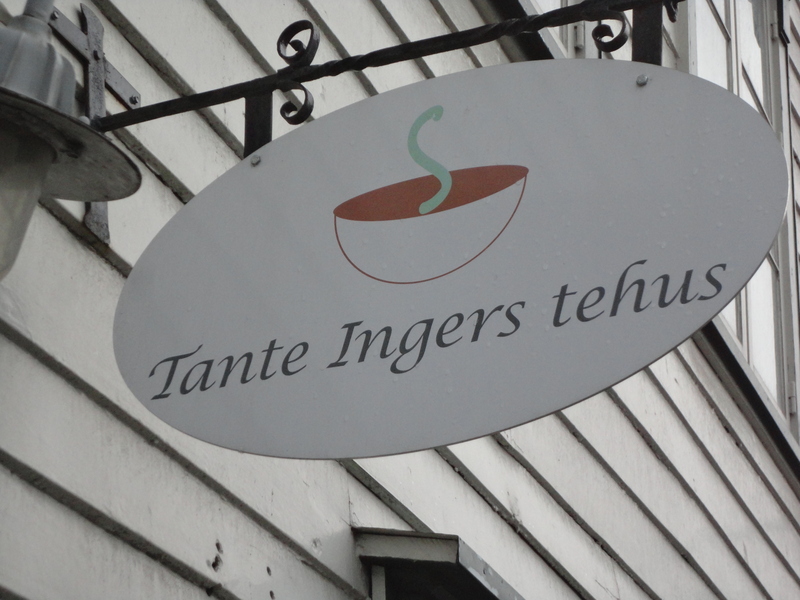 Lying just the other side was Tanter Ingers Tehus – the most northerly teashop in the world. 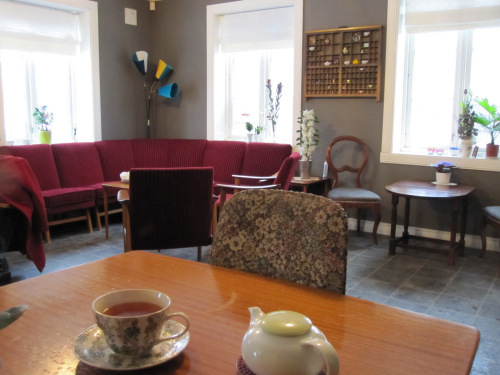 This seriously needed a visit and we were more than ready for a cup of tea. We were not disappointed. We were the only customers and had the pick of the seats. 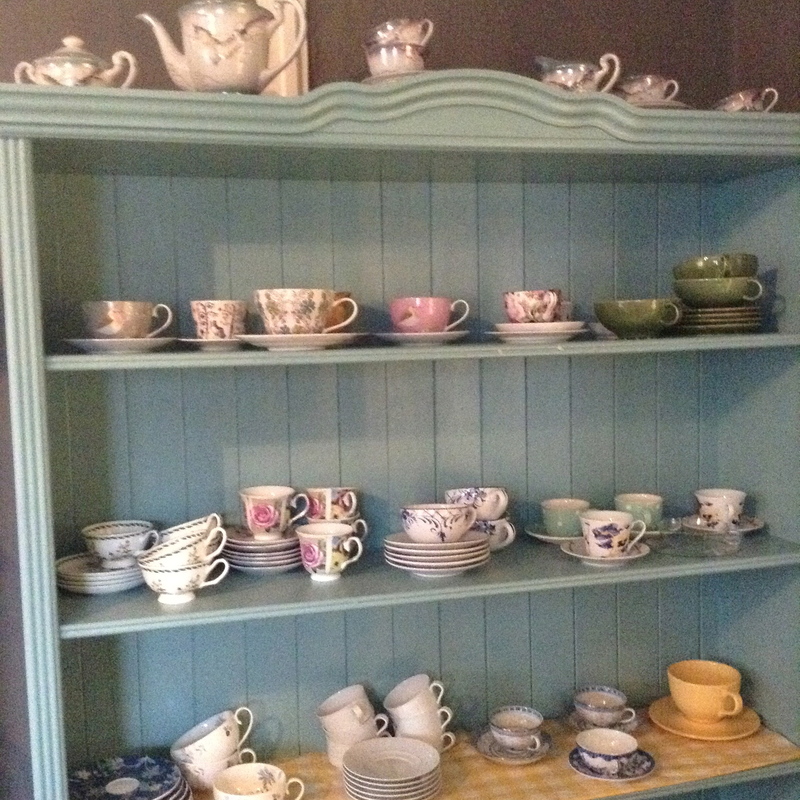 The old girl behind the counter invited us to choose our cup from a vast array of bone china crockery, which she said came from all over the world. 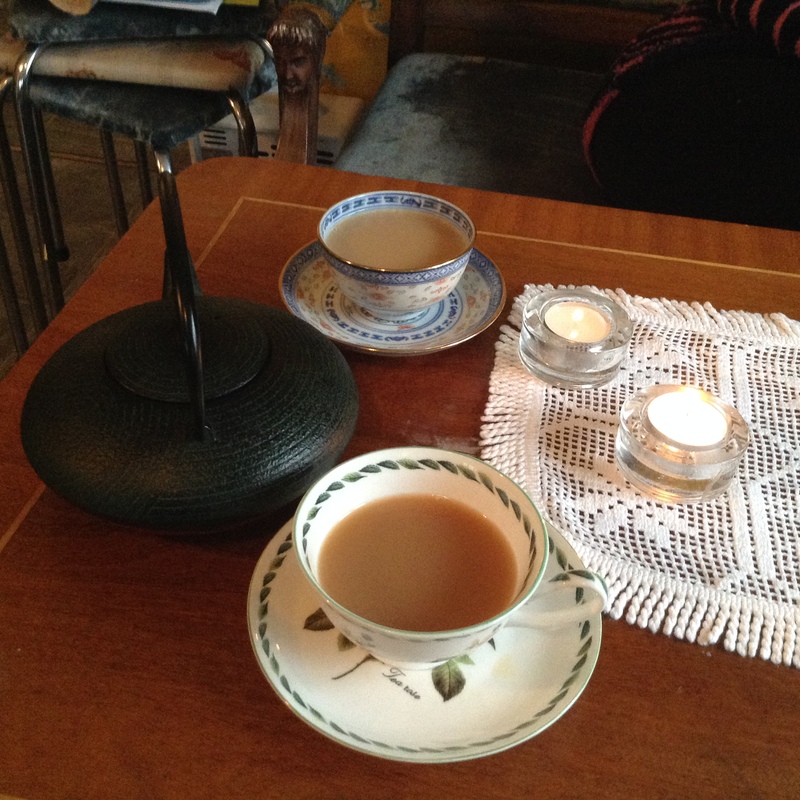 Boo chose a cup from Sweden and mine came from England. 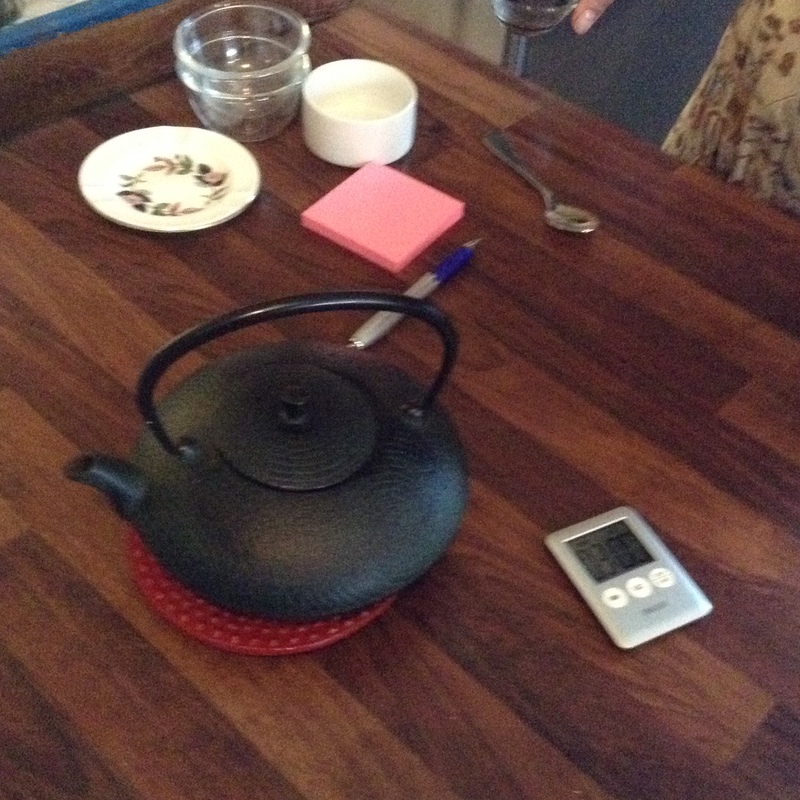 She then proceeded to brew some tea in a black cast iron tea pot, but would not let us near it till her timer permitted. 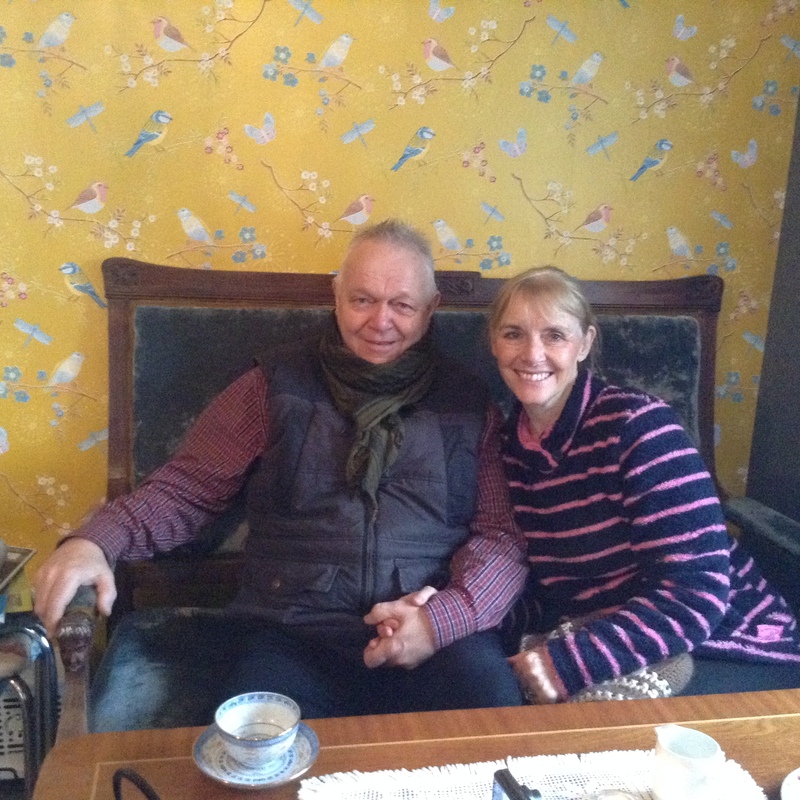 We sat and enjoyed the most glorious cup of tea – Boo… English Breakfast and mine… Darjeeling… all the flavour without the strength… We even treated ourselves to some cake even though we had waffles waiting in the hotel. We warmed up after the cold of the bridge and had the most splendid hour in that special place. In the quiet, I had chance to think about how much I love my fellow traveller. 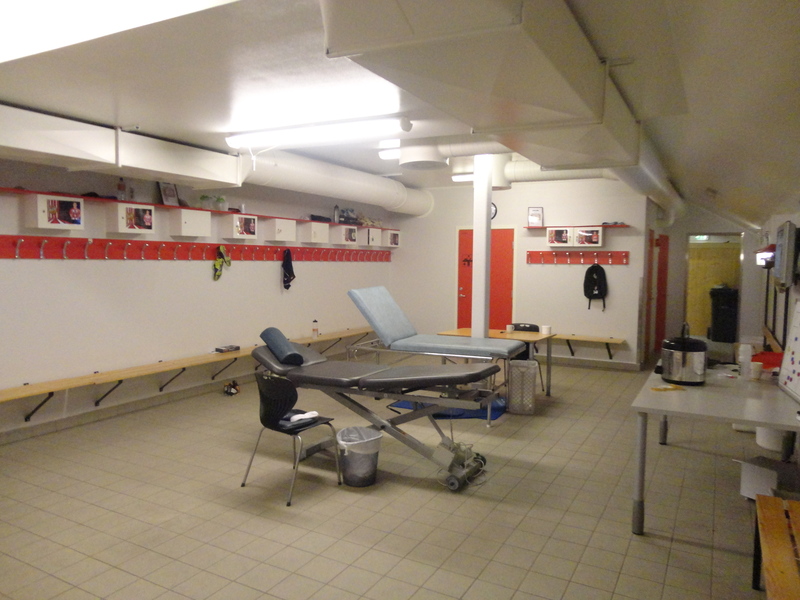 So we approached the final night in Tromsø. We had more or less decided to have one last shot at the lights but when we enquired none of the tours would promise to even go, the weather being so bad. We were told to check later in the afternoon. 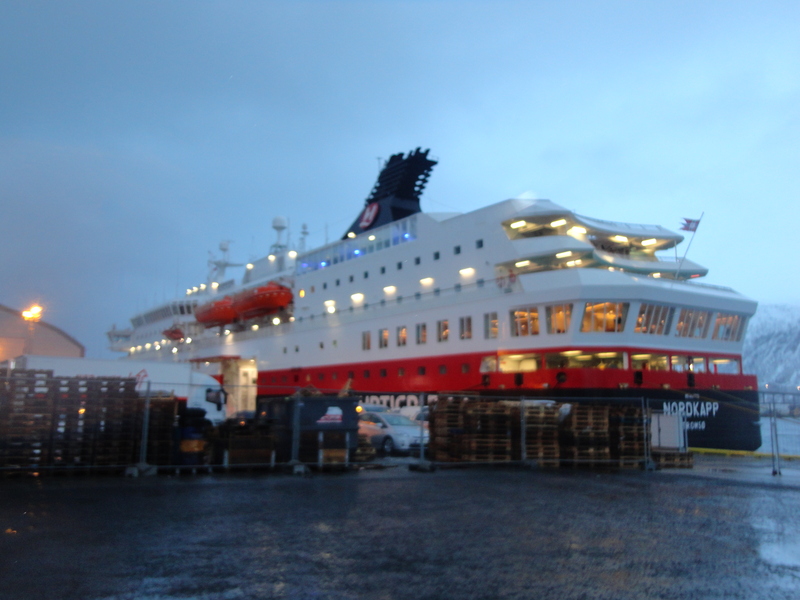 At 5.00pm I learnt that two tours were going – one heading for Finland again and the other going North towards Rakkfjorden. 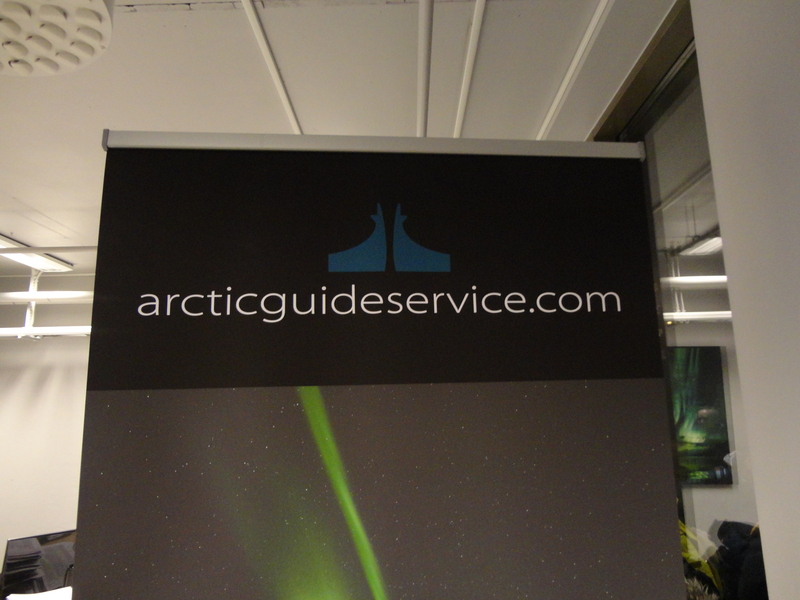 Despite the weather and the tug Finland had on us, we decided to go with The Arctic Guiding Services. They were not leaving till 8.00pm and heading for a break in the clouds near. This trip was on a proper coach which made the journey much more pleasurable and we got the front seat above the driver. We left just after eight and travelled for a couple of hours towards Rakkfjorden. We made several stops looking for clear skies, but the blizzard and driving rain just continued unabated. Amazingly just after eleven as we reached our destination the rain stopped. We got out into the freezing cold and gazed heavenwards. Much of the sky was covered with cloud but in the breaks we did see slight patches of green. What was amazing was that on photographs it was clearly green, but to the naked eye it was just like a cloud with a tinge of green. 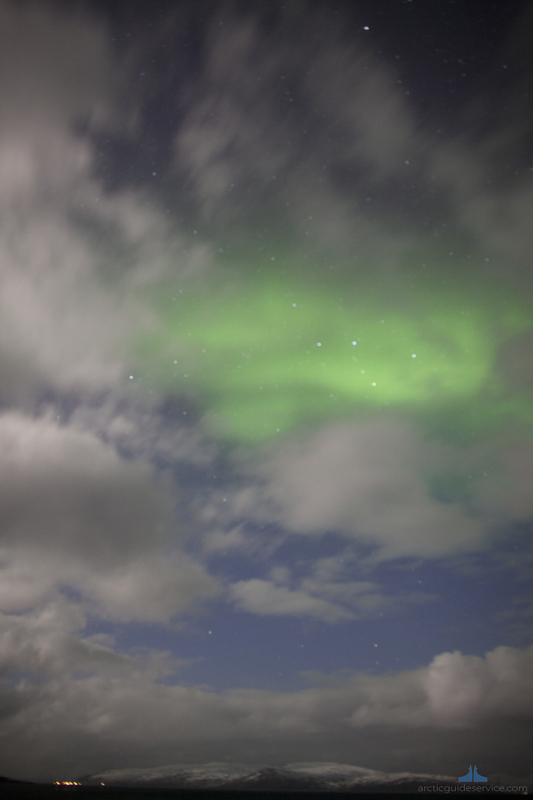 I was beginning to think that The Northern Lights are a bit like the Emperor’s New Clothes. We spent an hour or two here with some great people before the cloud closed in and stars were no longer visible. We left again somewhat frustrated. The photographs tell us we some of the Lights but our eyes and our minds thought differently. 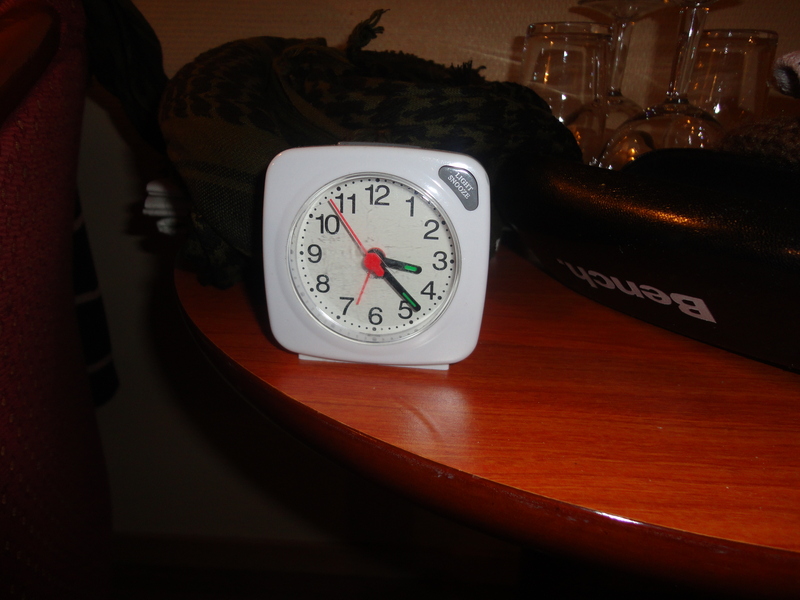 We got back to the hotel and about 4.00 a.m. ready for a sleep before checking out and heading home the following day. 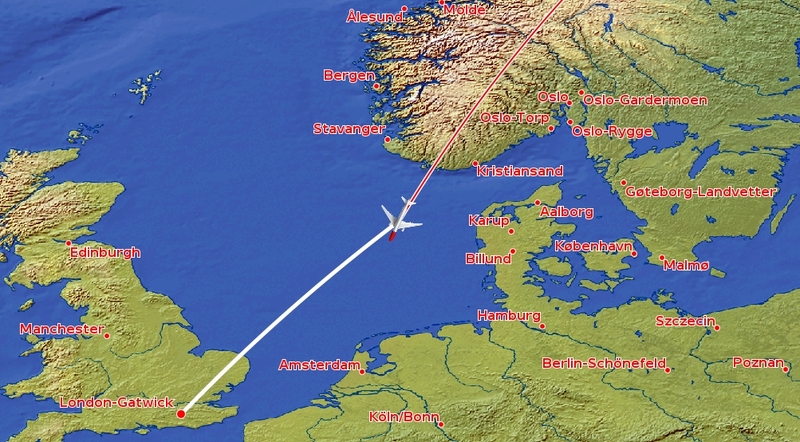 The flight home had Wi-Fi and we were able to follow the plane’s progress with great interest. 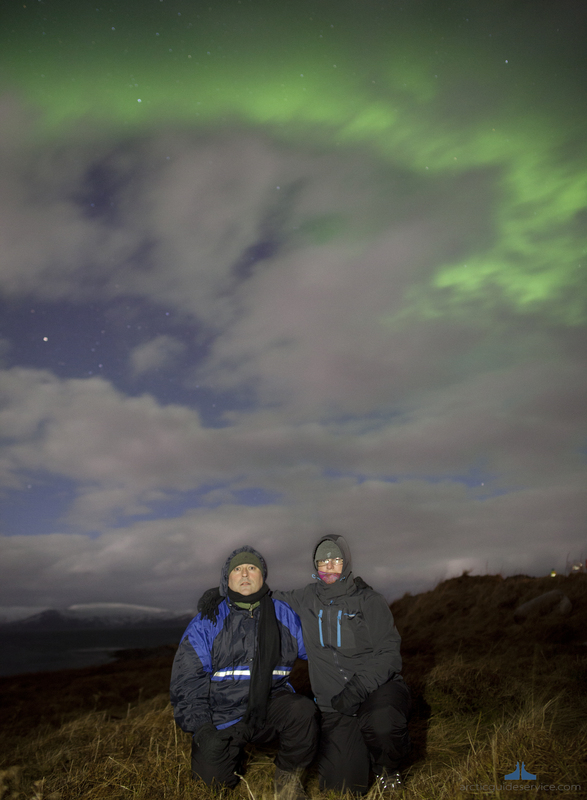 Iceland disappointed with The Northern Lights, Norway tempted us with just a little taste. The chase will continue in Finland in 2015.